THERMOPYLAE picking up the pilot at the mouth of the Columbia R.
Photo by Robert Reford, her agent. Tickets by reservation $50. Seating limited. The Thermopylae Club of Victoria is pleased to extend an invitation to its annual dinner. 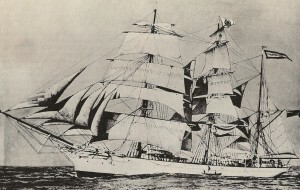 The club, marking its eighty-fourth year, is named after one of the fastest and most famous clipper ships of its time. Thermopylae operated in the tea trade towards the end of the 19th century. Victoria’s Inner Harbour was her home port for several years. Dinner speakers Mary Tasi and Wade Baker will unveil some of the remaining mystery surrounding Vancouver’s 18th-century exploration and survey of the Pacific Northwest coast on behalf of the British Crown and his high-level and respectful interaction with First Nations inhabitants. 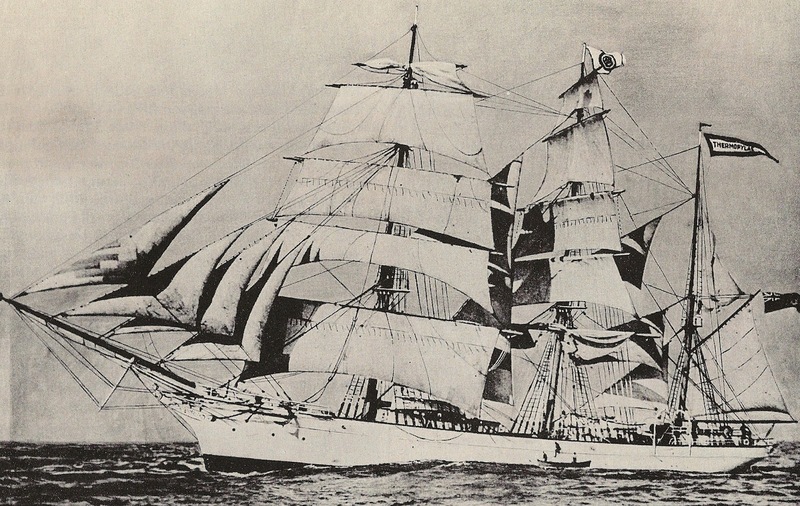 Their new book, The Hidden Journals: Captain Vancouver and His Mapmaker, is based on their seven years of museum and archival research, including assistance from the Maritime Museum of BC and Britain’s National Maritime Museum in Greenwich, and encompasses stories in the oral tradition from elders in Hawaii and on this coast. Mary Tasi will give a First Nations perspective of Vancouver and of his official cartographer, Lt. Joseph Baker. Author and artist Wade Baker is a member of the Squamish Nation and, according to cultural oral accounts, a descendant of Lt. Baker. The evening will follow the club’s traditional format of drinks before dinner (cash bar), a traditional seafarers’ dinner, the Ambrosia Ritual and dessert. The RVYC will serve corned beef and cabbage, with options of chicken, salmon or a vegetarian dish, and Plum Duff with Don Hope’s celebrated Ambrosia Rum Sauce. A ration of lime juice will be issued for the raising of toasts and the prevention of scurvy. Reservations can be made by contacting Captain Fred Fowler at fowler@shaw.ca or (250) 655-0668. Email is best. To guide the RVYC kitchen, attendees are requested to specify their meal preference (corned beef, chicken, salmon, or vegetarian) when making reservations. Reservations should be confirmed by payment before Wednesday 6 April with a cheque made out to “Thermopylae Club” and mailed to Fred Fowler, 9365 Captain’s Walk, Sidney, B.C. V8L 4G6. Does one need to be a member of the Thermopylae Club to attend the dinner whenever it will be this year? Must one be a member of the THemopylae Club in order to attend the 2017 Dinner Meeting?